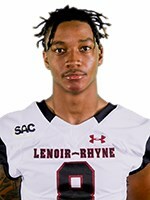 HICKORY – Scoring more than 50 points for the second straight game, Lenoir-Rhyne University gained its second football victory of the season Thursday afternoon, hammering visiting Mars Hill 59-27. In a game moved up to a 2 p.m. start in Moretz Stadium because of anticipated bad weather associated with Hurricane Florence hitting the North Carolina coast, the Bears jumped to an early 21-point lead. The game was originally scheduled to be played Saturday night at 6 p.m. in Hickory. LRU improved to 2-1 and 1-0 in the South Atlantic Conference (SAC) by winning and dropped the Lions to 0-3, 0-1. The Bears’ next game is Sept. 22, a road contest with a 6 p.m. kickoff at SAC preseason favorite Wingate. LRU scored three times in the first quarter on Thursday, twice getting touchdowns by Jaquay Mitchell (7-yard run, 16-yard pass reception). Bears quarterback Grayson Willingham went 8-for-10 for 154 yards and four touchdowns — all in the first half — before giving way to Cal Morris, who played the final 30 minutes. Xzavion Huff, Dareke Young, Mitchell and Kenny Carter each had a rushing TD for the Bears while T.J. Smith, Drake Starks, Mitchell and Ryan Carter all caught TDs for LRU. Craig Rucker had 10 receptions for 132 yards and two TDs for Mars Hill. The Bears’ 59 points are the most they have scored in a game since Nov. 9, 2013 (62 vs. Alderson Broaddus)… LRU scored 51 points in a victory at North Greenville, S.C., in its second game of the season… Bears head coach Drew Cronic has led LR to back-to-back wins, their first since winning three straight in 2015 … LRU rushed for 305 yards on 52 rushes…The 468 yards is the Bears’ fewest under Cronic … LRU beat Mars Hill for the first time since 2015.